Terroir: The grapes come exclusively form the best vineyards belonging to the Marchesi of Barolo. The low Guyot trellised system is used on moderately inclined hills which consist of soils particularly rich in clay and limestone. This type of soil is very compact, forcing the vine to dig deep in search of water. The result is particularly sparse bunches with small berries that give the wines an abundance of minerals and rich tannins. Vinification: The grapes are handpicked then, after being removed from the stalks, they are soft pressed. Fermentation’s temperature is controlled in thermo-conditioned tanks. Maceration of 10-12 days with pump-overs. Wine is transferred to cork-insulated cement tanks where post-fermentation temperatures (72ºF) are maintained and malolactic fermentation occurs spontaneously. The wine is aged for 3 years in the traditional Slavonian oak casks, (of 30, 120, 180 hectolitres). The wine is then aged an additional 3 years in the bottle prior to been released under the name of Riserva. Conserved in a cool, dark cellar, this wine has an aging potential of 25-30 years. Deep ruby red with orange highlights. An intense rose bouquet with scents of liquorice and spice. Full bodied, austere, yet elegant. A pleasant “goudron” becomes noticeably apparent after 7-8 years of aging. 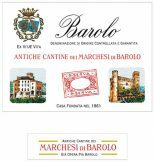 Rich, dry and deep in flavor, Barolo is an excellent accompaniment to red meats and spicy cheeses.